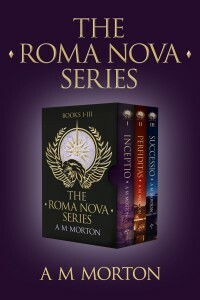 Meet Carina Mitela, 21st century Praetorian in Roma Nova, as she challenges all three. Transformation, deception, rebels, vengeance takers, comradeship and an epic love story in these three adventures in a new Rome founded sixteen hundred years ago by Roman dissidents, and ruled by women. Over 1,000 pages of action adventure and alternative historical thrills in three books with 140 five star reviews on Amazon between them. Roma Nova is at peace. Carina Mitela, the heir of a leading family, but choosing the life of an officer in the Praetorian Guard Special Forces, is not so sure. When a blackmailing letter arrives from a woman claiming to be her husband Conrad’s lost daughter and Conrad tries to shut Carina out, she senses danger crawling towards her.